This is a great Hudson River School book and, considering its affordable price, far exceeds some others. I've shared this book with my daughter who enjoyed it as well. Highly recommended. Louise Minks' 1999 "The Hudson River School" is a coffee table art book containing an excellent selection from a distinctively American genre, coupled with an informative narrative on the history of the movement. The narrative covers the three standard phases of the Hudson River School, from Formative to Mature to Expansionist.The text is liberally illustrated with approximately 60 color plates, many full-size, and a variety of black and white illustrations and artists' portraits.The illustrations include the work of 25 artists, among others: Albert Bierstadt, Frederic Church, Thomas Cole, Goerge Innes, and Worthington Whittredge. 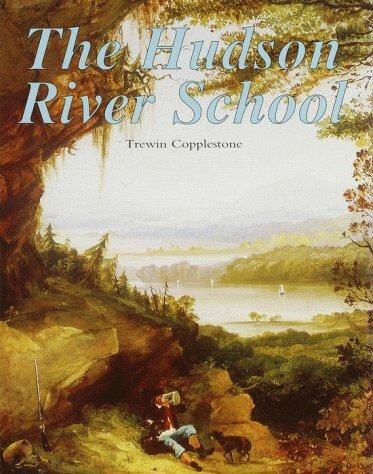 "The Hudson River School" is very highly recommended to fans of HRS, who will find the text and illustrations worth lingering over, and to art students looking for a good introduction to HRS. The pictures in this book are positively breathtaking.It is mainly about the paintings and phases of the movement.The sharpness of the images in this book are amazing and make it much more pleasurable to look at.I loved it. This is not a giant book, but it certainly is a beautiful one, in which you'll find a decent helping of full-color plates that portray the majestic representation of idealized landscape painting that came to be known as the Hudson River School. In an easily readable fourteen-page introduction, author Louise Minks takes us from about 1825, when the definition of this genre of landscape painting was beginning to form, to the last decades of the 19th Century, when the term "Hudson River School" came into vogue as a way of distancing the style from the emerging Barbizon School in France.Ms. Minks recounts the goings-on of the writers, patrons and artists which influenced many Hudson River School painters, such as Thomas Cole, Frederic Church, Martin Heade, George Inness, Worthington Whittredge and Albert Bierstadt, to name a few.Twenty black-and-white illustrations (mostly photos of paintings and noteworthy people) appear along with the text. The 80 color plates, about half of which extend to both pages of the open book, are arranged according to phases of the Hudson River School development:"Formative," "Mature," and "Expansionist. "Each phase is introduced with a page-long synopsis of what was happening at the time the artwork on the following pages was created.As expected, Cole, Bierstadt and Church are the most represented (25 artists overall).Also, Ms. Minks made sure to include in the color plates the artwork that was most discussed in the introduction.The color printing is of excellent quality, as is the paper stock on which the artwork appears.Given the size of the pages, I found it easy to spend a long time admiring all that was going on in each painting. The so-called Hudson River School has a place of special importance in the history of American painting.Although there were many 'professional' artists working in the early and developing American society from the 17th to the 19th centuries, most of them, apart from the many charming naive practitioners, were itinerant portrait painters or those who looked to Europe for their style and subject matter.It was not until the early 19th century that artists began to consider the landscape which surrounded them as an interesting subject in itself; when they did, they perceived a grandeur, spaciousness and quality of natural beauty which filled them with awe and wonderment. It was this opening of the eyes of their compatriots to their natural heritage that these painters, who have come to be known as the Hudson River School, initiated.Although, in the first instance, it was the area of the Hudson River stretching northwards from New York that first entranced them, as the American continent towards the Rockies unfolded, the artists followed and produced work that revealed a magnificence of scale—the great lakes, the towering mountains. deep valleys and gorges of the land in which they found themselves. In this way, although the Hudson River was the first area to exert its influence on these landscapists and gave its name to them, their work spread widely to encompass the whole land. There was also another, transcendental, aspect to their work.they recognized the hand of God in their new environment and accordingly introduced a sense of divine mission into their painting which appealed to the adventurous religious spirit of the early settlers.Through this, their art acquired a new significance which had previously been absent. The book is illustrated with 45 plates of original paintings.Each artist listed above has from one to seven plates of his work included. "Extras" are single examples from James Hamilton and George Peter Alexander Healy without biographical information. Unfortunately, the placement of the plates doesn't seem to follow any order.Appropriate plates are not necessarily adjacent to artist biographies.Alfred Bierstadt's "Niagara Falls" is included *twice*, while Frederic Edwin Church's depiction of the Falls is much better known and is even mentioned in his bio, but there's no visual.The lack of an index also makes it tricky to match the artists with their work. 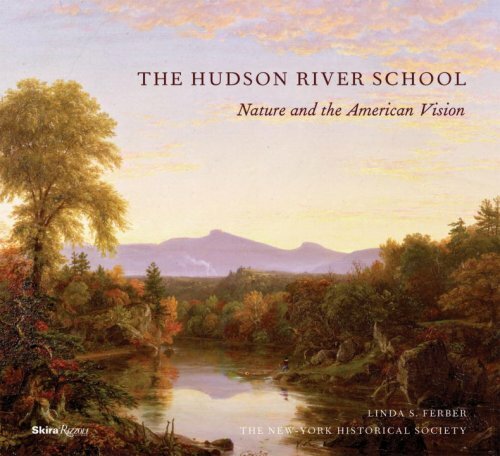 If you are a fan of the Hudson River school, you will not be disappointed with this book. The illustrations are large and clear, and the overview is precise. However, as noted by a previous reviewer, this is not a very detailed book. It is only a coffee table book after all. Arrived in excellent condition, fabulous book,prompt service, couldn't ask for any better value! This book is a reprint of a 1978 exhibition catalogue of one person's private collection. There is a short (7 page) essay at the beginning which gives an overview of the Hudson River School. The rest of the book consists of illustrations of around 60 paintings, each by a different artist. Most of the artists are obscure, while the well-known painters (Bierstadt, Church, Cole) are not represented by their best works. 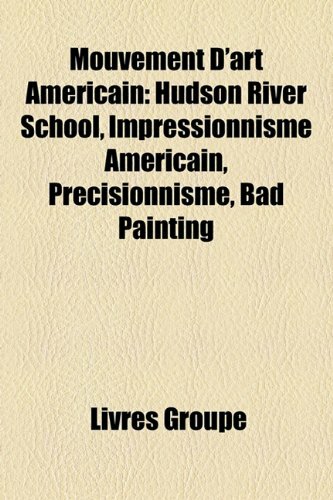 If you want an in-depth study of the Hudson River School with illustrations of its best paintings, this is not the book for you. This is an excellent early American art book. 24 paintings from famed 19th-century group that romanticized nature while capturing the scale, beauty and nobility of the Hudson River Valley and beyond. 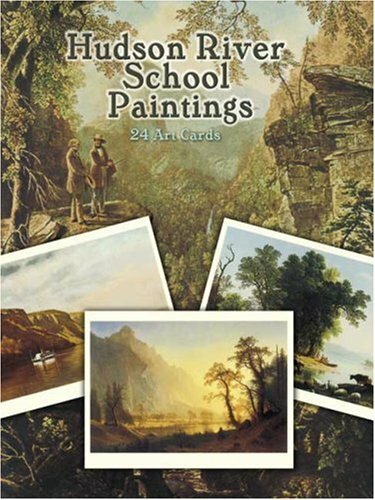 Superb reproductions of Cole’s The Clove, Catskills and Landscape Scene from The Last of the Mohicans, Durand’s Kindred Spirits, Cropsey’s Shad Fishing on the Hudson and 19 other magnificent works of art in ready-to-mail card format. Presenting concise overviews of artists and movements that are uniquely American, these volumes distill the essence of their subjects with authoritative texts and lavish illustrations. This is a large format book filled with paintings of several different famous landscape artists.Some paintings stretch to fill two pages and others are worked in at all different sizes.There is accompanying text to help you understand each artist and their role in this "Hudson Valley" artistic endeavor or community.Some of the paintings are reproduced very small and I would have liked to see them a bit larger, but overall this book is a great introduction to each of the artists and their work and an interesting overview of this school of artists.After seeing some of these paintings you'll definitely want to follow up on some of these artists and get a larger book on their works and life. 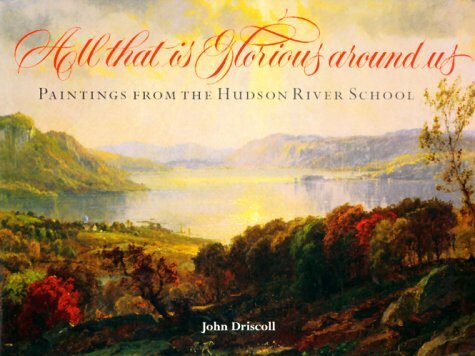 The Hudson River School of Artists included some of the World's greatest artists and their work can be found in this excellently produced book.This book is well written, well organized and shows off the treasures of the Hudson River Artists. It is perfect for your library, coffee table, and excellent as a gift to art students, history students, loved ones. Outstanding quality went in to this book. Very colorful book filled with paintings of 1800's America.I am a fan of Albert Bierstadt's paintings, but unfortunately there are none of his paintings shown.However, there are some great paintings by Frederick Church, Thomas Cole, Benjamin Champney, Samuel Colman, Jr., and many others that painted the Hudson River at that time. This book is not about different Hudson School painters painting the same view but in their own styles.As in history and in my life, I go out painting with other painters and we paint the same view.Each painting is unique but you can see that they were painted it in the area on the same day.This book has nothing to do with that idea.A nice book, as reviewed by others, but not what I expected. Sometimes when looking at these landscape paintings you feel you are looking out a window or are in the landscape itself. It's beautiful to see the natural, the wilderness,especially for me (like many others) who are surrounded by machines all day long. O'Toole does fine job explaining each painting and its symbols.For example, deers are symbolic of wilderness while cows are symbolic of man's encroachment into the wild. Another example, a scene of a boat with hay being guided by a tugboat toward dark clouds (the top picture on the cover) appears to be "a metaphor for man himself being guided through the challenges of nature's perils and his persistence in working to tame them..."
It is both beautiful and facinating, since it compares the styles specific to most of the artists of this era.It brings together the paintings that are meant to be reviewed together and makes them that much more amazing.It is a great book for lovers of the Hudson River School. Different Views In Hudson River School Painting by Judith Hansen O'Toole (Director and CEO of the Westmoreland Museum of American Art, Greensburg, Pennsylvania) is an expansive and beautifully presented anthology of the art and the artists who pioneered the first native style of American landscape painting. 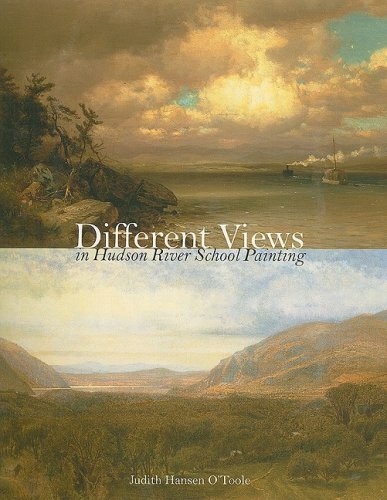 Providing readers with an illustrative compendium of examples supported by an informative and "reader friendly" text, Different Views In Hudson River School Painting delves deep into the study of many various artists in terms of their diverse styles and productivity. 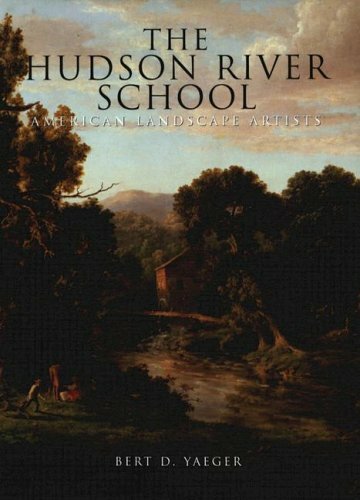 A perfect edition to personal, academic, and community library Art History collections, Different Views In Hudson River School Painting is very highly recommended and informative reading. Beautiful book with many lovely reproductions of good quality. Each image is well documented, many with preliminary sketches also reproduced. Biographical information is readable and enlightening. One of the American masters of landscape painting in the nineteenth century was Sanford Robinson Gifford, and though he was highly celebrated in his lifetime, his name appears now only occasionally when the topic of the Hudson River School of art is discussed.This excellent monograph, which accompanied an exhibition of his work in 2003 - 2004, serves to restore the reputation of one of our less widely known artists who captured Americana on canvas and was an important leader of the Hudson River School of painting. 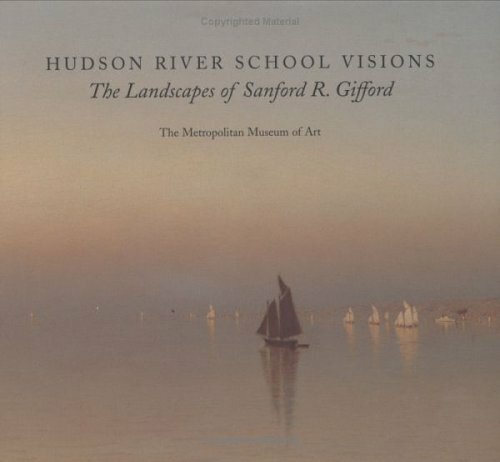 More than seventy reproductions of Gifford's paintings and drawings grace the pages of this book - scenes of the Adirondacks and Catskills, luminous river scenes filled with the transparency of fog and light.But the book also serves as an historicaldocument with photographs and information about Gifford and his travels abroad with the obvious influence of JMW Turner.His perception and use of ambient light so distinct to the Hudson River Valleyare both discussed and illustrated. The painters of the Hudson River School saw in the American frontier an idyllic landscape of soaring peaks, wide rivers, and golden sunlight. * Featuring the inspiring works of Asher B. Durand, Thomas Cole, William Trost Richards, and John Frederick Kensett, the The Hudson River School 2011 Wall Calendar gathers together 12 of the most beautiful landscapes in all of American painting. * A celebration of the 400th anniversary of Henry Hudson's historic first voyage up the river that now bears his name. The conservative agenda gets in the way! I purchased this book after enjoying an exhibit of Hudson River School paintings.While the premise of the book is an interesting one, I couldn't get past the conservative politics!It was Newt Gingrich's quote & the mention of Lynne Cheney as a harbinger of moral change that pushed me over the edge.I was hoping to gain a further appreciation of the genre, but found myself too iritated by the modern day political commentary to keep reading.If you have BOTH an appreciation of the school & a conservative political outlook--this is probably the book for you. However, if you find conservative definitions of morality and cultural standards off-putting, don't bother with this one! Anyone alarmed by the loss of cultural standards in America today will find this book fascinating. Mr. Cooper clearly demonstrates the relationship between culture and art. We are reminded of a time in our nations youth when the arts served to lift up and inspire, when truth, virtue and beauty were not doubted but sought after because they represented the very best of what we could be. Today much of our art points in the opposite direction, not celebrating what we aspire to be but pointing out the worst of what we are. As an artist in todays culture I can attest to the accuracy of Mr.Coopers observations concerning the role modern art has played in our cultural decline.I can also confirm the great hunger for art that lifts the spirit and inspires our hopes and dreams. I highly recommend this book for its insight into the importance of our creative endeavors and how we direct them. I hope it serves as an inspiration to all artists seeking to better the world through their gifts. 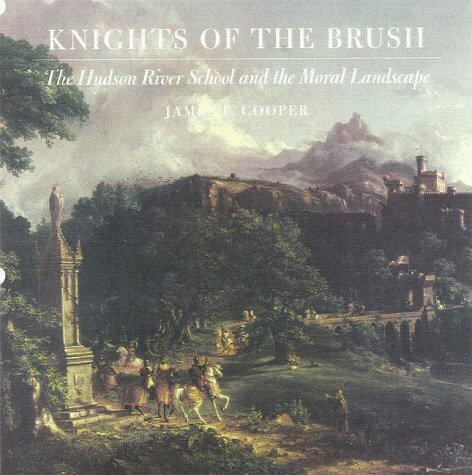 "Knights of the Brush" is a fascinating book on the Hudson River School landscape painters, but it is not (repeat not) by the novelist James Fenimore Cooper! The author, a distinguished art historian, is James F. Cooper and unlike the novelist is very much alive! That said, I find the book a little strange. Mr. Cooper analyses and discusses a wide range of Hudson River landscape paintings by painters such as Thomas Cole, Frederick Church, and Jasper Cropsey -- stressing their moral and religious intent and content in a way that should increase appreciation of their merit. The book is filled with attractive color reproductions of their works. But this is coupled with a sometimes repetitious jeremiad against current "post-modern" culture and ethics and apparently everything else to do with contemporary American culture. Somehow the art history and appreciation and the political pamphlet do not live happily with each other. Readers and art lovers can enjoy and appreciate "Knights of the Brush," and the author's passion for art, without necessarily accepting all his passion for turning back the cultural clock. Then you will find this a worthwhile book.Cooper begins with the argument that the aesthetic is the most highly developed aspect of a society.Once the aesthetic sense begins to fray, then society is on a slippery slope where the moral vision begins to lose focus and eventually, may collapse. 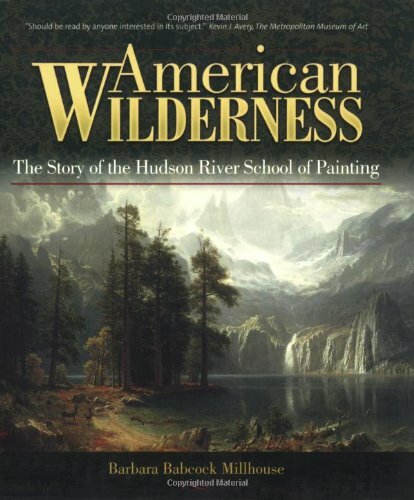 This is a classic story of decline and fall, and Cooper puts the Golden Age with the Hudson River School of American art.The book takes the moral values of the early 19th Century Americans, natives like Cropsey as well as immigrants like Thomas Cole, and illustrates their beliefs with representative, breathtaking paintings.Some of the strongest points are made in contrasting the moral vision which informs the Hudson River School with the altogether bleak view of the human condition which is seen in representative works from 20th century painters like Hopper and Andrew Wyeth. Cooper does effectively demolish the canard that these artists were little more than shills for the new capitalist order.Given the view which these men held, that to truely view nature is the glimpse the hand of God on earth, if they had painted mills and factories, they would have clearly been less than worshipful of their subject. However, Cooper's thesis becomes a little repetitive as each chapter keeps coming back to the same theme with slightly different wording. This is an outstanding book. It is not an art book. It is a history book. As the title clearly states, this is "The story of the Hudson River School of Painting".So, if you are simply looking for a book on painting with pretty pictures, this is not for you.On the other hand if you are looking for a book that covers the lives of the painters, discuss the social, economic, and scientific movements that influenced the artistsand places the Hudson River School in the larger historical context of the period, this is the book for you.The book is well written and contains many interesting historical tidbits of information. Did you know, for example, that Samuel F.B. Morse (the later inventor of the telegraph) was an artist by profession and president of the National Academy of Design or that Thomas Cole (the painter) traveled to Columbia to follow the route of the famous German naturalist and explorer Alexander von Humboldt?If you are ever in the Hudson Valley and plan on visiting Church's Olana, the Samuel Morse estate, the Thomas Cole Historic Site, or walking the Hudson River School Art Trail, this is a book that will enrich your experience. This book is a joke. These are the reasons: The author talks about how handsome an artist was instead of how he painted; he talked about what day an artist ate a boiled egg with whom (who cares; may be he ate a scrambled egg the next day) instead of more relevant events. May be this is why he subtitled the book: "The Story of the Hudson River School of Painting." The worst of all about this book is the pictures. They are small; 90+% are about or smaller than a post card. The pictures were badly reproduced, very dark, totally off-colors (when compare with other books), blur or messed as if they were printed 60-75 years ago when printing technology was still considered primitive. My husband, a very reputable artist in our area, said looking at the pictures were like looking at them under a half-moon night--can't see any details although you know they are landscape paintings--and that is all you can see. This book is also very small and has few pictures although this is not a problem if the materials (writing & pictures) are good. The only picture that is about average is the one on the cover. In short, this is the worst book about Hudson River School paintings I have ever bought. A quality piece of work from the Princeton University Press. This edition is now out of print. Nine essays on Luminism, each of them with End Notes. Index. 10 page Bibliography. While many people are familiar with the Hudson River "School" of art, far fewer realize that out of that movement came the American Luminist movement of the mid 19th Century.While some of the Hudson River artists were also luminists, most of their landscapes are not.The Luminists generally painted smaller landscapes than the HRS artists, they are always extremely peaceful scenes, often rather mono-tone in color, and most of all sublime.That is, the solid mountains or hills in the distance faded into the vapor of the atmosphere, which captured the light of the sun or moon, giving the picture a luminist look. 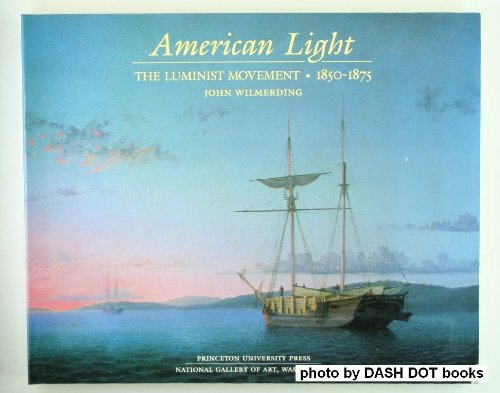 This book first gives the qualifications of Luminist painting.Then, it follows many of the artists and describes their focus on capturing the light of Nature in their landscapes.Many - even most - of the greatest Luminists were highly concerned with the Spiritual and trying to show God's Hand in the world through their paintings. 2003's "Hudson River School" is the catalogue, in hardcover, of a remarkable exhibition of art by the Wadsworth Atheneum Museum of Art.The book contains a brief introduction to the Hudson River School genre of nature scenes and landscapes, popularized by a group of American artists in the mid-19th century.The catalogue itself offers color plates of 57 paintings by a variety of artists, including, among others, Albert Bierstadt, Frederic Church, William Bradford, and John Kensit.The sections are organized by artist, with a brief biography and commentary on the paintings in the plates. As the selection includes those paintings from each artist owned by the Wadsworth, readers may not necessarily find the most famous examples of each man's work.However, the selection on offer is wide ranging and superb, featuring early American landscapes mixed with others from Europe and South America.The collection is easily worth the attention of fans of the Hudson River School and highly recommended to them and to students of that genre.